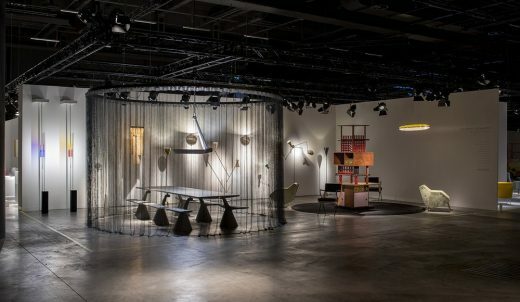 The two main design assets from two distinctive design periods, Sottsass’ monument-like tower-furniture “La casa con la Bambina Cinese” from 1962 and Grcic’s recently designed concrete table with lamp “Magliana”, are forming the foreground of the presentation, each one exhibited within it’s own space-defining circle: the black mesh curtain for Grcic and black carpet for Sottsass. Sottsass, with its powerful presence, opens-up itself to the passing-by public as an invitation to enter the exhibition. The four seats of casa Galli by Carlo De Carli, orbiting around and looking outwards, emphasize the total circumference of the object. Meanwhile the concrete Magliana project of Grcic, wrapped in the circular curtain designed by Dekleva-Gregoric, being simultaneously enclosed and exposed, doubles as the temporary conference room for Roberto Giustini and Stefano Stagetti with collectors. 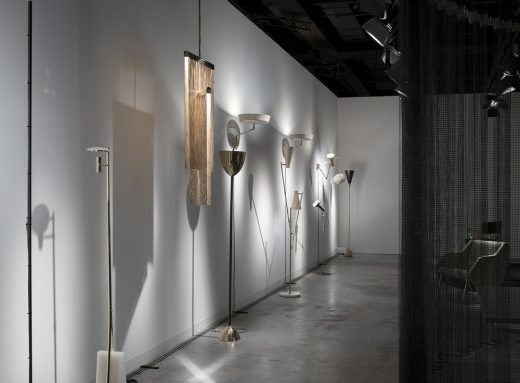 In the background, facing the long white wall, the series of rhythmic progression of luminaries speak the narrative of casting light and shadow. Beginning with the two luminaries by Formafantasma casting their colorful light spectrum to the wall, the series of rhythmic progression continues with a set of luminaries (by Luigi Caccia Dominioni, Franco Buzzi, Ettore Sottsass and Sarfatti Vigano) which projecting their own shadows while casting alternative existence to the white wall. 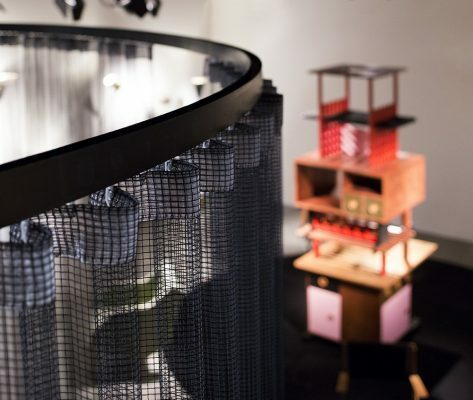 For the first time, the gallery exhibits a unique and exceptional furniture by Ettore Sottsass, realized in the early 1960s for the so-called “Casa con la bambina cinese”. The tower-furniture was conceived as the main element of a private apartment in Milan “high from the floor to the ceiling and always different on its four faces, with shelves, counters, grates, columns, drawers, etc.” More than a piece of furniture it’s a temple, a monument or perhaps a giant toy, made of solids and voids, different perspectives and colors, an exemplary work by one of the greatest authors of the twentieth century. 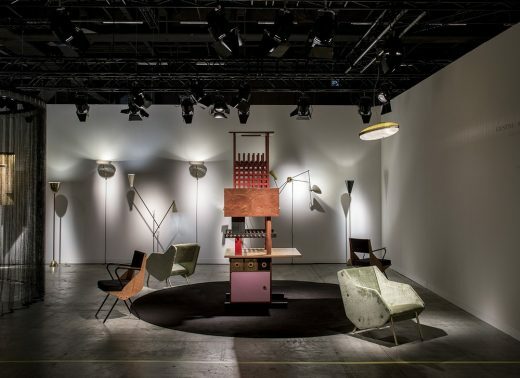 Among the many Italian authors of the twentieth century presented this year, the gallery exhibits for the first time, part of the rare furnishings designed in 1948 by the Italian architect Carlo De Carli for Casa Galli, a private residence in Milan. Trained in the firm of Gio Ponti, since he was young Carlo De Carli has studied the problem of the continuity between architecture and human space, each environment is built and defined by the owner’s ways of living, the elements are minimized, the forms are dynamic, while the choice of materials and surfaces is determined by the function. 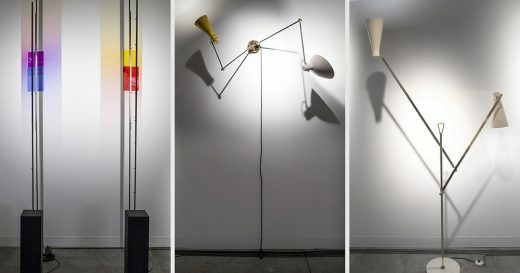 Also the lamps designed by Sarfatti & Viganò, are part of Casa Galli furnishings, unique variants of pieces that at the time were in production. 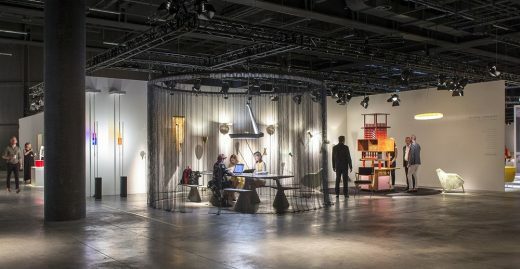 On view also the most recent project of the gallery, presented for the first time in an international context and exclusively designed by Konstantin Grcic, among the most influential designer of the last twenty years. 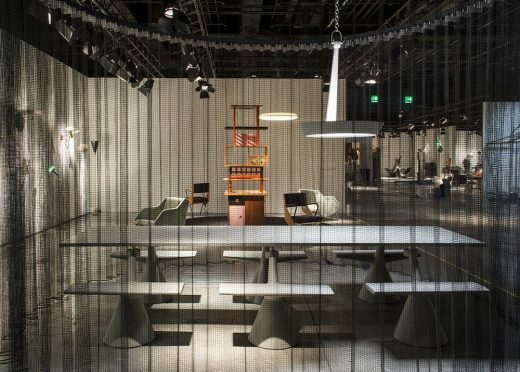 The furniture, part of the “Magliana Project”, is presented as a corpus of limited edition elements, consisting of modular tables with integrated seating and suspension lighting, all executed entirely in concrete, inspired by the building principles of Italian architect Pier Luigi Nervi, inventor of the ferro-concrete. In sharing certain distinctive traits of Nervi’s expressive engineering aesthetic, Konstantin Grcic pays homage to the great Italian genius with his latest work, which is destined to become a new classic of his repertoire, and of collectable design at large. 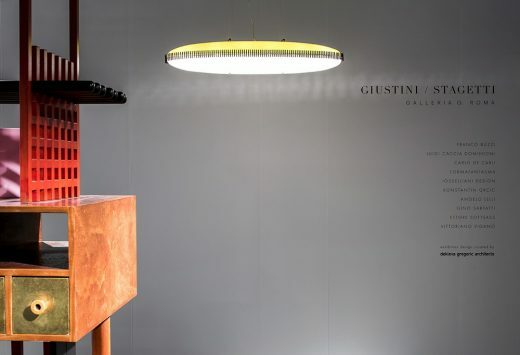 On the background a large corpus of lights confronts different interpretation of the lighting design: from the light as a shape to the shape of the light, with the latest works by Formafantasma and Iosselliani Design. This year, the booth area appears divided into two sections circumscribed within two circles, revealing two structuralism visions. 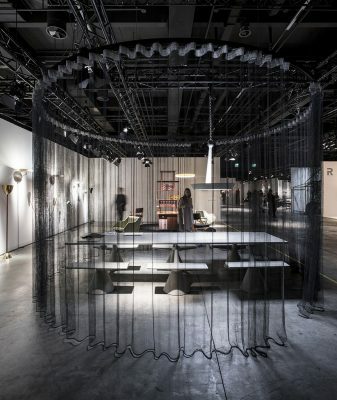 On the left the circular curtain system of Dekleva Gregorič encloses the table of Grcic expressing a dogmatic semiprivate atmosphere, while on the right the disposition of furniture and seating on a circular carpet reflects a more open space organization. dekleva gregorič architects is an architectural practice based in Ljubljana, Slovenia and founded by Aljoša Dekleva and Tina Gregorič. Alongside their architectural practice they are intensively involved in reshaping approaches to architectural education. Aljoša Dekleva is Programme Director of Architectural Association Visiting School Slovenia, and is currently Guest Professor of Architecture at Ecole Nationale Supérieure d’Architecture Paris Val de Seine. Tina Gregorič is Professor of Architecture at TU Wien, Austria. They lecture extensively both in Slovenia and abroad, presenting their practice and their research. Several Dekleva Gregorič projects explore the topic of home and dwelling, including their first project, the internationally awarded and exhibited, 43 m2 XXS house built in 2004 in central Ljubljana. In 2012 their project Clifftop house on Maui, Hawaii received the AIT Award and International Architecture Awards 2012. Recently, they have managed to improve social interaction with a series of small but distinct shared spaces as part of large collective housing project Brick neighbourhood in Ljubljana. In 2015 they explored the potentials of redefining regional tradition and condensed family life in Compact Karst House, which won the WAN House of the Year 2015 Award, Best architects 16 Award, and was commended in the prestigious AR House Award 2015, by Architectural Review, UK. Architects Aljoša Dekleva and Tina Gregorič tend to continuously question the role of architecture in an attempt to improve our society.